Chris - It's over 7 miles down to the deepest part of the Pacific Ocean. The pressure there is more than 1,000 atmospheres. What's actually down there, if anything? How can we find out? Alan - My name is Alan Jamieson. I'm a research fellow at the University of Aberdeen's Ocean Lab and what I primarily work on is exploration of the deepest points in the ocean. This is basically made up of the deep subduction trenches around the pacific rim. We have designed video cameras and still cameras that can descend through the water column and hit the sea floor completely unattached and unmanned. They take footage of animals attracted to bait and they do that for up to 24 hours. At the end of the experimental period, we send an acoustic command to these systems and they drop ballast weights and float to the surface. We then download them and see what we filmed. On top of that, we also have some traps which are positioned around the bottom of the lander to catch small scavenging species. Chris - And they're dragged up too? Alan - Yes, they are. Chris - When you say deep, when you talk about these sorts of trenches, how deep is deep? Alan - The trench we're looking at is a biological zone that's called the hadal zone, so it's actually deeper than the abyss. The abyss is just technically 3,000 to 6,000 metres. What we're looking at is the hadal zone which is 6,000 to 11,000 metres, which is about 5 to 7 miles deep. Chris - Just paint a picture of what it looks like. What's it like down there? Alan - Dark. Primarily dark. There's absolutely no solar light influence whatsoever beyond about 1,000 metres, so if there is any light it's probably biological produced by bioluminescence. The trench habitat is a characteristic V-shape in cross section. When you see images of trenches in journals and on TV, they tend to exaggerate the vertical scales. When you look at a whole trench, it's probably not quite as steep as you'd imagine but there are places which we've seen and which we can see on charts that are up to 45 or 50 degree slopes. Chris - And how much life is down there? Alan - Far more than you would think. I think when we started this in 2006, there wasn't really much information to go on. Pretty much, all the big sampling expeditions happened in the 1950s. So the Danish Galathea and a Russian expeditions went out and did lots of trawling and grabbing all around the Pacific. Since then, nobody really did anything at all, so what we've been trying to do is deploy our cameras in as many different trenches as possible because what we're seeing is similar trends in each trench. What seems to happen is certain species become far more abundant the deeper you go. 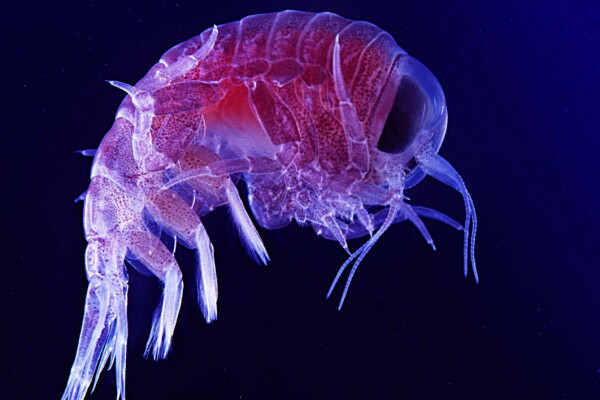 So when you go to 10,000 metres for example, we see more of an animal called an amphipod than you'll see anywhere else in the ocean. Chris - Are these big creatures or are we at the depth where you're down to the scale of microbes and tiny stuff only? Alan - No, I wouldn't say the word 'big creatures' but the amphipods which turn up after a couple of hours of filming, there were several thousand in the view of the camera, and they're all maybe between 10 - 20 millimetres long. Down to 8,000 metres we find fish that can be up to 30 centimetres long quite easily. We see brittle stars, holothurians and things like that, of exactly the same size you would find them off the coast of Scotland. Chris - Now you mentioned that you look at multiple trenches. So given that you've got species sitting in the bottom of those trenches and that between the trenches you have a ridge of shallower water, organisms cannot spread from the depths of one trench into the next trench because that ridge is in the way. So, do you end up with very unique ecosystems down there then in these deep places? Alan - Yeah. What you're referring to is what we call abyssal partitioning. It means that the hadal zone has been partitioned by often a vast span of the abyssal plane which can be more than a thousand kilometres. In some species, what you find is they only seem to exist at a very deep point in one trench and then you'll find them again in the deep point in other trench. If you look in between they're not there. There's two explanations for that - one could be they had a common ancestor that was capable of going shallower and for some reason, the shallow end of the population has since died out. Secondly it could be that the previous population was capable of traversing across these ridges. Chris - And when you recover these animals up, are you able to get clues from working on them about how they tolerate those environments that they inhabit under those extraordinary conditions? Alan - Yes. It's not quite the line of research we've been doing ourselves but there's a little bit of work that's going on based on some of our samples. It does seem to be there that they are able to cope with high hydrostatic pressure. I mean, we're talking up to a ton per square centimetre, and very low temperatures which are normally less than 2 degrees. Being able to adapt to this is obviously a prerequisite to survival, so they all do it. What we're finding is there's some taxa that doesn't quite make it all the way to the deep and there's some that do quite happily. It's possilbe on a cellular level of course to find differences in the genes between the high pressure animals compared to shallow animals. So there's definitely a high pressure adaptation. Chris - And apart from the obvious academic interest of exploring in detail an area which has largely been neglected, what else are you able to glean from doing this? What's the other spin-off from it? Alan - Our ultimate goal I guess in the future, maybe not at this stage because trying to biologically map these trenches is an enormous task. I mean, we think we've done lots and lots of deployments but the scale of a trench is enormous. Ultimately, what we're thinking of is the ocean from the top to the bottom and it's particularly now when we've got changing environment, things like that, that ocean conservation takes an anthropocentric opinion. The opinion that the deeper you are, the less important it is. The ocean should be considered as a whole though, not just necessarily the depth at which you can dive and take nice photographs and so on. So yeah, it all plays a big part. Furthermore it seems the trenches are playing a fairly major role in carbon cycling as well, because ultimately, all the sediment in the deep abyssal planes ends up being subducted back into Earth's mantle. If all the carbon that's taken up in the surface layer eventually dies and sinks to the bottom, and is consumed and recycled, and buried at the same time, eventually it will end up in the trenches. So that's a new line of research which is just beginning in other institutes. Chris - Have you got any evidence that man's activities could impact on that or are you trying to quantify how important or what sort of contribution it makes to carbon handling? Alan - In terms of carbon handling, I'm not sure. I know that it's almost certain that man has other impacts at those kind of depths. I saw an image recently at a conference from a Challenger Deep, the deepest place in the world, and one of the first things to find when they got there was a raincoat. Chris - I guess that's what they call a water jacket. Aberdeen Marine Biologist Alan Jamieson who's other claim to fame is having a new species of shrimp named after him. Princaxelia jamiesoni is white and it's about 6 centimetres long and lives several thousand metres underwater. Alan is a bit bigger but he does spend quite a bit of time at sea. Next Shopping Online - Are Reviews Trustworthy? Do many plants signal danger to their neighbours? Are air cavities in the body a problem when diving deep?